You have Willard drop from the ceiling. He lands on one of the cultist's robes, softening his landing; from there, you have him stir up as much chaos as you can. You have him run around, knocking over candles, grabbing one in his mouth and hauling it across the room. The chanting stops as panic and confusion sets in... followed by anger, as the cultists start to realize what's happening. "That rat--!" "There!" Though the chanting has stopped, blood continues to seep out of the floor. It moves, flowing, coalescing at one edge of the circle. You send a message to Michelle to get ready to move. You may have to make your way to the church, one way or another. You try to have Willard spell something out in the blood and ritual paint, but you can't get the time; the cultists lunge forward, trying to stomp on Willard. You're forced to focus on trying to keep your rat alive, rather than sending any deliberate messages. The blood begins to rise, and build--the cultists, distracted by Willard, don't seem to notice the mass behind them. "Did Enyo do this?!" "It might just be a stupid rat!" As the cultists shout, trying to kill Willard in the confined room, the woman chained to the pipe notices the... thing building in the corner. Meat and bone begin to form from it, spreading into appendages. Nerves and hair and musculature start to emerge. "Oh my GOD, what IS that? !," she shouts. 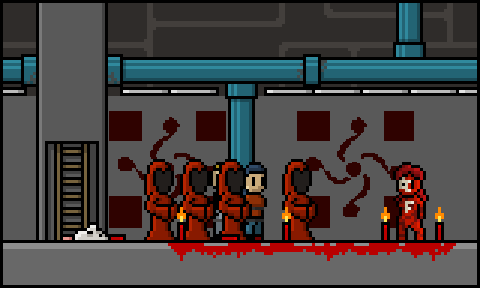 Only one of the cultists turns, but he immediately starts grabbing the attention of the others. "Uhhh... UHHH...!" He slaps weakly at his associates' robes. By the time they turn around, it's mostly assumed a human shape. It hisses, gurgles, blood spewing out of more blood. Fluid becomes tissue, body parts cracking as they sink into place and rearrange. Finally, its vocal cords develop. You can now give orders to Red(?). "Leave th... the rat alone...", she forces out. She takes a step forward, or tries to; her bones haven't sealed in place yet, and her muscles aren't wound tight enough. Skin starts to spread across the surface, but the inside of her is still mostly goo; the flesh disappears into the viscous, person-shaped mass. The cultists back away, nervously. They've seen a great deal, and they expected the ritual to do something, but... not this. "His name..." she chokes out, "...is... Willard." She collapses all at once, bone and tissue and organs and meat and blood becoming vague slime as she spills to the floor. The cultists are silent, stunned, gawking with wide eyes under their hoods. At the top of the ladder, you hear a door slam open. "Finally!," shouts a voice from upstairs and on the phone. You can no longer give orders to Red(?). What? I hope Red is ok... and Willard as well. Well, heck. That was certainly a moment. Anyways, now that we've managed to avert a potential disaster and our new friend on the phone has almost made it into the ritual chamber... Seems like it's time to get down to business and talk to the cultists. Hopefully, the fact that the Many are vouching for us should help expedite things. Also, yes. Check up on our Red. If that was her being externalized, I can't imagine that being a fun experience. Eesh. You mess with the rat you get The Blood! Orchestrate the safe release of the tied and get their names, get the names of the cultists 'Thale' check them, then hand the phone over to Crease and Zene. Try to talk to Red, see if she's fine again, now that it's over. Tell the cultists we can come free them from Thale now if they wish. Step 1, check if we're okay. Step 2, check if Red's okay. Step 3, where were we with negotiations? Move Willard to make sure he doesn't accidentally get crushed by the incoming cultist. Check on Red, and us for that matter (make sure we're still all together). Then continue the conversation and let's arrange to meet in person. Ask how far they can go (can they leave the church or will we have to meet in it?) and if we'll have to deal with (I really don't want to use the words, "fear" or, "worry") The Many if we meet close to xem. The ritual is stopped so I hope Red is ok. Please check on her. Willard can answer yes or no questions by turning a circle for no and walking a short line and back for yes. If the cultists can understand this it will be impressive but they can be prompted.